Episode 25: The Act of Making and Unmaking. So we’re back it would seem for reals this time. For those just joining us welcome, for those returning thanks for coming back! For the next few months we’ll be giving an insight into dearly kept Ozark secret, The River Pretty Writers Retreat! 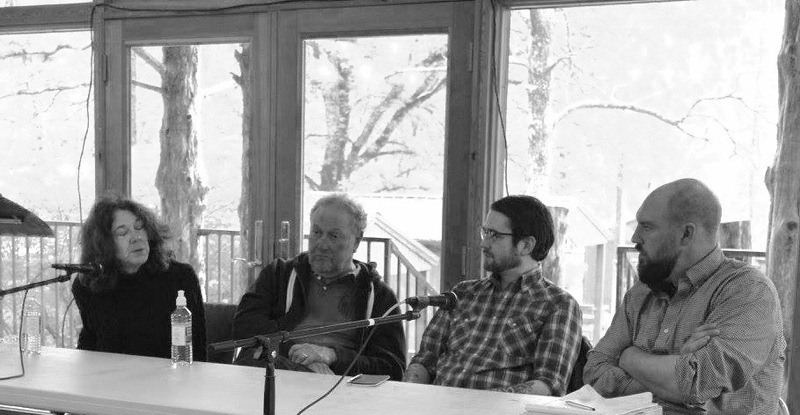 And in this episode we hit the ground running with a wonderful discussion with Lawrence Sutin, Mary Ruefle and Cole Closer! Essentially the masters of the universe give or take. We discuss all our own quarks and amoebas of writing and none of us really agree with one another, I mean we do, but we differentiate and this is what I always wanted the podcast to be. So if you’re new, this is what we’re doing from here on out, for veteran listeners this is the talk I always wanted. Um, oh god I say that a lot on the panel, but um is just a short arc from Om, and if we don’t get there in the panel we get close. So sit back or sit forward, unlace your shoes and tie them up again, and again, then take a breath wink at totem of your being and give a listen because it’ll be all right and alright. Enjoy now! Mary Ruefle was born in Pennsylvania in 1952. She is the author of many books. Her website has been designed to allow readers to experience her erasure books, which can otherwise not be seen as they are old, friable, one-of-kind things. It is also a way for prospective collectors and buyers to preview the books without handling. The books will be changed eventually. Mary is a writer, or to use the parlance of our times, an artist. Lawrence Sutin was born in St. Paul, Minnesota on October 12, 1951. His parents, Jack and Rochelle Sutin, were Holocaust survivors who fought as Jewish partisans in Poland during World War Two. He graduated from St. Louis Park High School in Minnesota and then earned an undergraduate degree in psychology and English from the University of Michigan and a law degree from Harvard University. Since 1984 he has been a full-time writer and teacher, publishing books in multiple genres including biography, memoir, history and the novel. He is also currently working in the field of text-and-collage erasure books. He currently is a professor in the Creative Writing and Liberal Studies Programs of Hamline University and teaches in the low-residency program of the Vermont College of Fine Arts. He has been married to Mab Nulty, a psychologist, since 1990. He has three children, Ceallaigh Anderson (stepdaughter), Brennan Vance (stepson), and Sarah Sutin (daughter). He also has a part-beagle part-German shepherd dog, Murphy. He tries to lead a quiet life devoted to writing, family, friends, reading and listening to music. It doesn’t always work out quietly but he does the best he can. Cole Closser holds an MFA in Sequential Art from the Center for Cartoon Studies in White River Junction, Vermont. His first graphic novel, Little Tommy Lost (Koyama Press), was named one of the ten best graphic novels of 2013 by A.V. Club (the Onion), and nominated for the Will Eisner Comic Industry Award in the category of Best Publication Design at the 2014 San Diego Comic-Con. Cole is an Assistant Professor of Art & Design at Missouri State University in Springfield, Missouri—and is a regular guest faculty member at the River Pretty Writers Retreat in Tecumseh, Missouri, where he leads a workshop in sequential art/graphic narrative. Cole’s work has been featured in such publications as Regular Show from Boom Studios, Little Nemo: Dream Another Dream from Locust Moon Press, and The Dreadfuls from Rotland Press. Cole’s forthcoming graphic novel Black Rat will debut this September at the Small Press Expo, from Koyama Press. Cole is generally a nice guy, but don’t jive talk him. He enjoys reading books with funny pictures, watching old cartoons, and wrestling alligators. Cole likes cats.